First of all, thank you so much for your positive responses to the youtube question. Great things take time, though, haha. Anyways, today I have a DIY for you that is very fun. 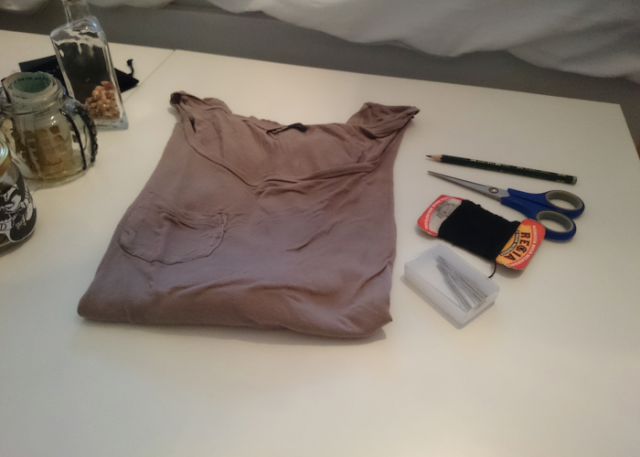 I saw this picture on tumblr and I was like “I need that top.” So I did it myself! 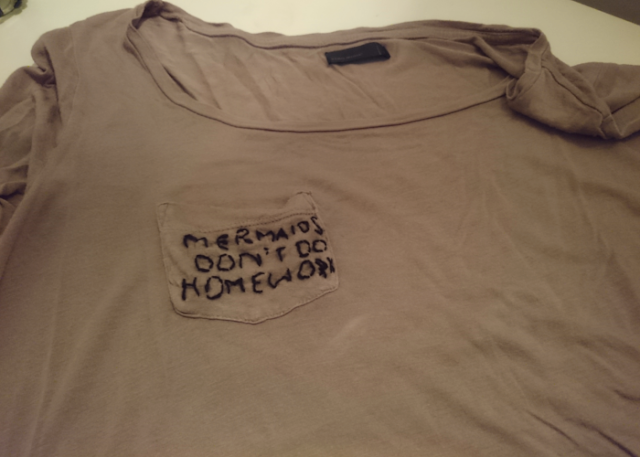 So all you’re gonna do is write words on the pocket of the shirt (in my case, it was”mermaids don’t do homework”) and then stitch each letter. Don’t worry if it doesn’t turn out perfect, the messy look is very cool! This is something you can perfectly do while watching TV, youtube videos or even something for school. Which is what I did last week when studying for my finals. That reminds me: My finals are over, guys, yaaaay! I’m so happy right now and I’m looking forward to doing a lot of things, blogging, reading books, etc. …until school starts again in April. Yes, I still have a few months of school left. Won’t be that stressed, at least. Jedenfalls habe ich heute ein supercooles DIY für euch! Ich habe dieses Bild bei tumblr gesehen und wollte das Shirt sofort haben. Also habe ich es selbstgemacht! 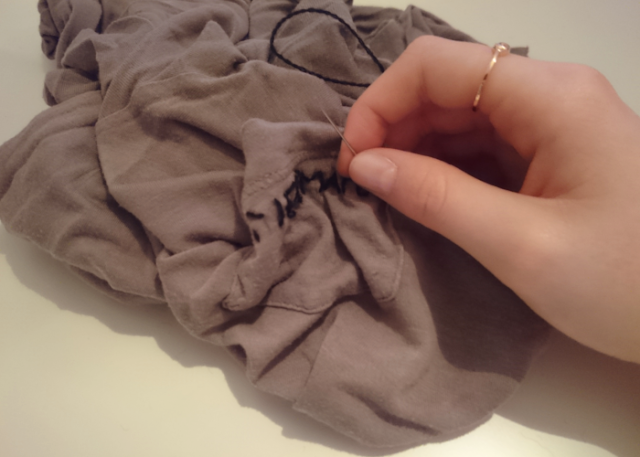 Jetzt müsst ihr nur die gewünschten Worte auf die Tasche des Shirts schreiben und anschließend nachsticken. Macht euch keinen Kopf, wenn es nicht perfekt aussieht, das Chaotische ist gerade das Coole daran! Das ist übrigens etwas, was man sehr gut beim Fernsehen oder so machen kann – oder wenn man etwas für die Schule macht, so wie ich letzte Woche. Da fällt mir ein: Meine Abiturprüfungen sind vorbei, juhuuu! Ich freue mich gerade so und ich habe jetzt endlich wieder Zeit, um viele tolle Dinge zu machen, zu bloggen, ein Buch zu lesen usw… bis die Schule im April wieder losgeht. Ein paar Monate Schule liegen noch vor mir, allerdings wird das wenigstens nicht mehr ganz so stressig wie bisher. Gefällt mir um ehrlich zu sein nicht so, sorry.